Having lived on the east coast all my life I was not exposed to TFT until the release of their first album. Prior to that they had done many hours on radio. That's where I felt cheated. If only I could have been a part of that audience. In 1972 they released "Dear Friends"; a collection of bits from their radio years. Here the group performed on a level different from their more formal recorded work. They were free to improvise and allow their individual talents to intermingle and create the wildest of scenarios. Listening to them jam free form is just as enjoyable as being swept away by their scripted material. Examples of the former approach to their art had been available only to those individuals who were lucky enough to own the group's radio material in its original LP format (very rare). Others had recorded the shows from the radio with varying degrees of quality. This year, with the release of "Duke of Madness Motors", all 80+ hours of Firesign's Dear Friends era radio shows on a DVD-ROM plus a companion book are available. Alas, I no longer feel cheated. 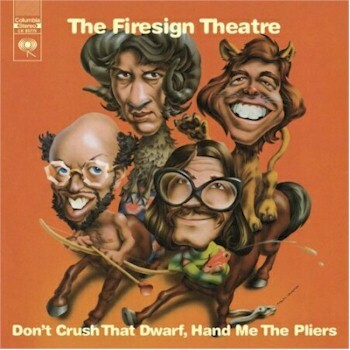 In 2008, the Firesign Theatre released a four-CD boxed set based on their most-famous character, Nick Danger "Third Eye." The group plans to reissue all of their past Firesign albums with new bonus material. Ironically I just found one of their albums in a box of records I put out for a Yard sale this past weekend. Thank GOD no one bought it. I think Im going to break out the old turntable. Rocky Rococo at your cervix. I first heard these crazy guys on WBAI radio in New York (a listener-sponsored station where I once spent 30 hours straight as Tally during a pledge drive), when they played the group's first album, "Waiting for the Electrician, or Someone Like Him." I memorized the bits, along with those on their next few albums. Saw them a few years ago in a 25th-anniversary reunion tour, too. Speaking of WBAI, they also influenced me -- and my sense of humor -- by introducing me to Arlo Guthrie's "Alice's Restaurant", Tom Lehrer's "Vatican Rag" and other songs, and to Thralawattle, a strange new religion "for the aware intellectual".